The Flag Football invitational is located on the football fields at Abbott Sports Complex in Lincoln, just off Interstate 80. The address for Abbottt Sports Complex is 7600 N 70th St, Lincoln, NE 68517. Below you can reference a Google map for driving directions, as well as a venue map to give you an idea of the competition layout. 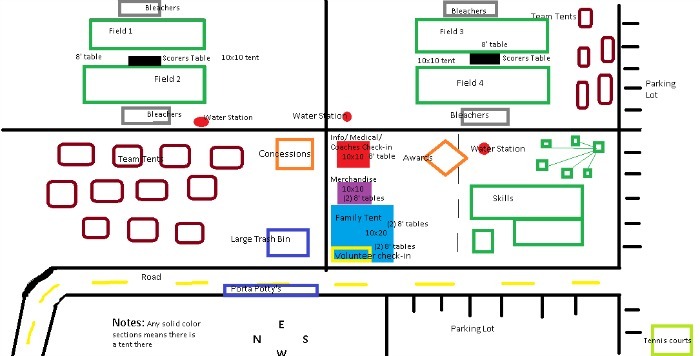 Download the Competition Layout Map Here! We are excited to offer concessions at this year's competition, which will be provided by Hy-Vee. Concessions will be available Saturday and Sunday from 10:45am-3:00pm near the team tents. A menu of available options and prices is below.